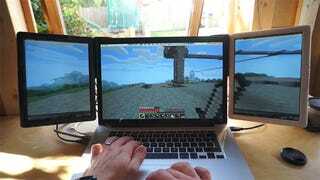 Matt Relf has found a smart way to turn a small laptop into the kind of multi-screen setup you normally only see on a verge large desk with a very important desktop computer. He's running a Kickstarter called Packed Pixels, which uses a mount to attach either one or two iPad-sized displays to the side of a laptop screen, giving the user a small wrap-around effect only with the benefits of portability. It's not guaranteed to work with all laptops, but for around USD$240 (that's for the brackets and displays) it sounds like it's worth a shot if this is something that actually appeals to you. You crazy person.